Inspired by last night’s Academy Awards, I wanted to link this week’s post to a couple of related themes, namely Los Angeles area startups (including those in FinTech), and explore the concept of winners vs. losers in the FinTech category. Yes, the awards show was a bit of a let down – but having just returned from a trip last week to Los Angeles, where I’d lived for about five years, I wanted to talk a little bit about the area (not traditionally known for its startup scene). Last month, I was excited to hear the news that that my friend, Bill McKnight, had joined RealtyMogul as SVP of Product. I’ve known Bill since 2006 when he was at Rent.com (acquired and later spun out of eBay). RealtyMogul is a FinTech success story, but will write more about real estate in a future post. But since the focus is on Los Angeles, I have to call out another innovator in this space that’s more focused on lending (vs. buying an ownerships stake in a building) and with a slightly greater emphasis on residential vs. commercial property: Patch of Land. They get a lot of buzz in the FinTech circles, and should have a break out year in 2015. Beyond RealtyMogul, other local FinTech firms to track are Zest Finance, FastPay, CapLinked, and StockR. Later I’ll write a more detailed overview of these, but one SoCal company I’d like to call out for special attention is Acorns. 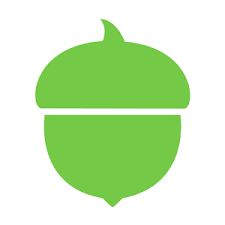 To me, Acorns is one of the better FinTech stories out there. It combines many things that I believe in. First, the move away from a “unified app” view of the world, i.e. the idea that’s championed by the big banks out there that you need to sign into your bank account to do anything. I think in today’s world, it’s far better to have a focused app strategy. Second, Acorns employs good “behavioral science” to actual problems. Specifically, most people say they want to save, but due to inertia or banks making it hard, people often don’t do the right thing. Prof. Schiller from Yale has written persuasively on this, leading to simple but effective changes, such as auto enrollment of people into 401k plans (vs. requiring filling out forms). I’m also a fan that they take something somewhat arcane, i.e. the Markowitz portfolio theory of investments (which was maybe my favorite concept from B-school) and make it simple to understand and apply to real life. By encouraging savings (“pay yourself first’), making it inexpensive and smart, I think Acorns has a lot of potential to do real social good, which is the other reason I like Acorns, with the last being its a mobile first business. Check them out! FinTech startups or banks should check out LA-based startup, Prevoty. Sticking with the Oscar theme, a question I’ve been thinking a lot about of late is who are the winners and losers in FinTech. What’s striking to me is the recent focus on which regions will win. I was intrigued by a recent claim by a UK newspaper that 50k people work in FinTech in London. The article didn’t say, but I think the figure makes sense only if you include tech workers at banks (e.g. Barclays) and related providers (e.g. IBM). 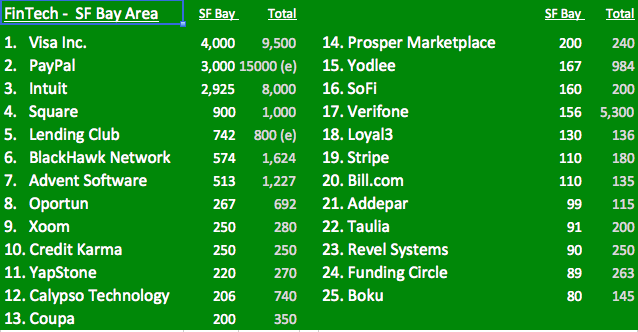 This table shows the SF / Silicon Valley FinTech players ranked by employees (adapted from recent SF Business Times article). While I’ve seen lots of lists of “most innovative” players in FinTech, I would like to see this table showing actual employment for other cities (e.g. London, New York). As an Oscar night-inspired post, I’d like to give a shout out to those based in Los Angeles I admire: Gary Braitman, a colleague from Scient, now EVP at Wells Fargo. Jason Farmer, at Dollar Shave Club. Bridget Baker at Baker Media (ex NBC Universal). Robert Cerny, investor and lawyer at Hinshow & Culbertson. Drew Planting, real estate investor. Bennett Pozil at East-West Bank. In terms of FinTech VC’s, there is of course CoreVC, which is one of the best, led by Arjan Schutte, who founded Core after leaving CFSI. I’m also a fan of Kat Utecht at CoreVC. It’s good there are other tech-oriented VC’s like Upfront Ventures in Santa Monica. Posted on February 24, 2015 June 18, 2015 by Michael Halloran	This entry was posted in Uncategorized and tagged Acorns, CapLinked, CoreVC, FastPay, Patch of Land, Prevoty, RealtyMogul, StockR, Upfront Ventures, Zest Finance. Bookmark the permalink. Thank you thank you, could I just take this opportunity to say that it’s good to see the balance of success as evenly spread across the globe as could be hoped.